Also known as late luteal phase dysphoric disorder, Premenstrual Syndrome, or PMS, afflicts up to 40% of women during their reproductive years. For the majority of sufferers, it‚Äôs a minor inconvenience, but for some it can be debilitating. Some women also experience positive PMS symptoms, such as increased creativity, energy, industriousness, and sexual interest. Light therapy is administered via a light box or smaller portable ‚Äúlight book‚Äù that emits 10,000 lux light. Light therapy users sit 12-24 inches away from the light source (distance may vary based on the device used) with their eyes open. The light is used for 30 minutes per day on average, though duration may be adjusted downward or upward as needed because individual responses to bright light vary. There is evidence that light therapy may provide benefits for certain PMS sufferers who experience negative symptoms. Approximately 25% of PMS sufferers say that their symptoms worsen during certain times of the year, particularly the darker fall and winter months. This is a similar pattern to that of Seasonal Affective Disorder (S.A.D. ), which is characterized by a winter depression that lifts during the lighter months of spring and summer. Also, many PMS sufferers manifest circadian rhythm abnormalities similar to those who are depressed. 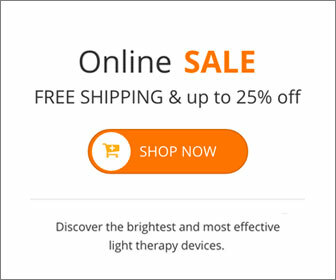 Light therapy, which is effective in treating S.A.D. and non-seasonal depression, also shows promise for treating PMS and PMDD symptoms. Overall, there have been only a few controlled studies of light therapy for PMS or the more severe PMDD, but many subjects in these trials achieved a significant reduction in symptoms. Side effects of light therapy, if they occur, tend to be mild. They may include headache, eyestrain, or jitteriness. Given that it is relatively safe for most people, light therapy may be worth exploring if alternative treatments for PMS depression and other symptoms don’t work. However, consulting a doctor before beginning light therapy is recommended. This entry was posted on Thursday, September 9th, 2010 at 10:40 am	and is filed under Light Therapy. You can follow any responses to this entry through the RSS 2.0 feed.